Kings XI Punjab took the top spot on the Indian Premier League points table with a 9 wicket win over the Kolkata Knight Riders at the Eden Gardens. 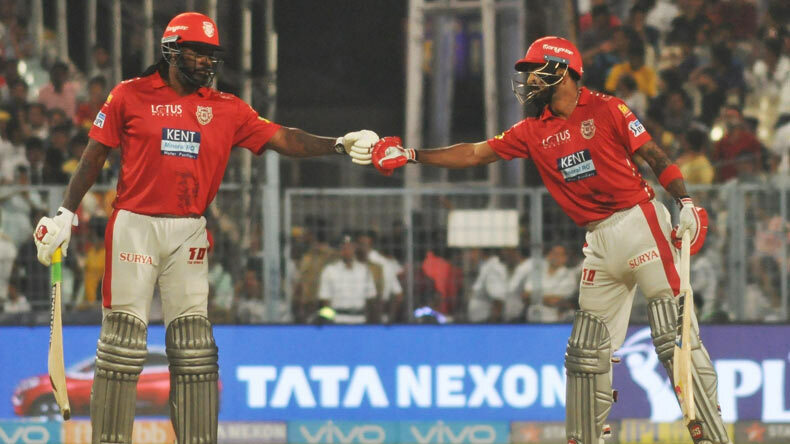 Chris Gayle and KL Rahul slammed a half-century each to continue their stupendous run in the season and help their side clinch the victory with 11 balls to spare. The match was reduced to 13 overs after rain interrupted play for close to an hour with the target reduced to 125 in 13 overs. Chris Gayle was once again the showman for Kings XI Punjab as he put up another phenomenal display with the bat to help Kings XI Punjab take the top spot in the IPL points table. When the West Indies southpaw went unsold in the first two rounds of the IPL auction there was certainly an uneasy buzz of how the tournament would unfold without one of the format’s biggest superstar but KXIP raised up to the occasion and showed their trust in the Universe Boss and picked him at the last minute. Ever since making his debut in the tournament this year, Gayle has destroyed three top bowling attacks in three matches with two half-centuries and a century. The story today was no different with the Jamaican once again entertaining the crowd with his flawless attacking prowess but he was outshined today by his opening partner KL Rahul who blasted his second half-century of the tournament and combined formidably with Gayle to get better off the KKR bowlers. Chasing a good 192, Rahul and Gayle were off to a flyer with a solid start and they continued the momentum until rain halted the play having a final say in the chase. But by the time rain could have affected, Kings XI Punjab were in a more than comfortable position if the game was to be called off with Duckworth Lewis determining the result. As KKR bowlers lost their sweat on dealing with a fearless Gayle who was running havoc at the Eden Gardens, it was KL Rahul who took the opportunity and batted beautifully while playing some splendid cricketing shots. In his 60 (27) Rahul rarely played a miscalculated or a mistimed shot and with Gayle posted a huge 73 on board inside the power play overs. Gayle in his unbeaten 38-ball 68 blasted 5 fours and six sixes and went bonkers. He once again celebrated his 14th IPL half-century in his trademark style dedicating it to his daughter. The duo has been fantastic so far for the Kings XI Punjab and continues to be their show stealer. Earlier in the game, Kolkata Knight Riders were off to a poor start with Sunil Narine getting dismissed for cheap but Robin Uthappa 34 (23) and Chris Lynn 41 (74) put up a 72 runs stand for the second wicket ensuring the platform for a good total. After Uthappa was removed by Ashwin, Nitish Rana too was dismissed for cheap getting run out in a bizarre way. It was skipper Dinesh Karthik with his 28-ball 43 who steered the innings further and took KKR to a confident total. However, their bowlers who have so far been brilliant in the tournament failed to contain Gayle and Rahul and gave away the match easily. KXIP chased down the revised target of 125 with 11 balls to spare and will go back to Mohali delighted with how they performed on all fronts in the game.